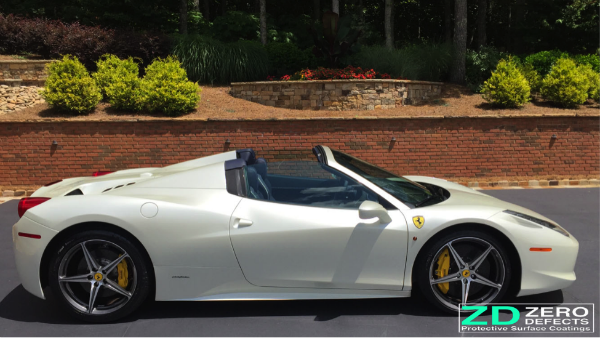 This absolutely stunning 2015 Ferrari 458 Italia Spider was custom ordered by one of my very best customer’s to add to his collection of high end sports cars. This car was ordered several months before and was totally custom built to his liking. Everything from the interior leather color, stitching, piping, wheels, caliper color, carbon bits, and a very unique color that was an extra $18k option. 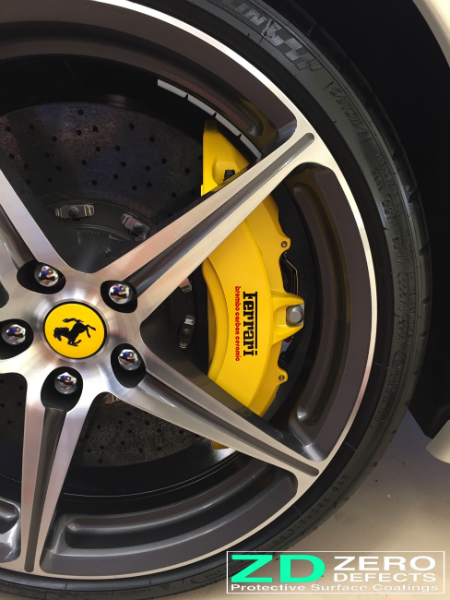 This custom color took an extra week during the build process from Ferrari. 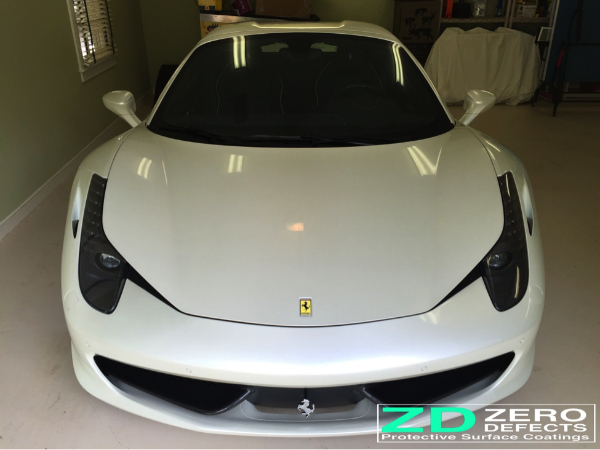 The color is called Bianco Fuji and this is the only 458 in this color that the Ferrari dealership knows about. Every single detail on this car was custom ordered the way the owner wanted. 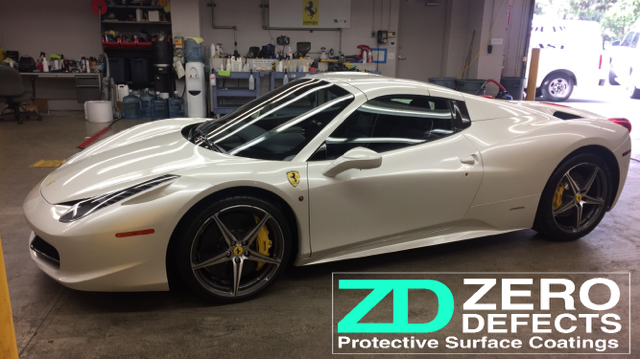 The owner and I had made arrangements with the dealership to have PPF (Paint Protection Film) installed before delivery. We also wanted to fully inspect the paint before the film was installed to make sure there were not any defects that would be underneath the film. So I was called in to do a pre delivery inspection and correct any issues if there were any. 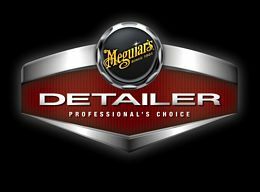 The car was prepared by the dealerships detail department already before I got there. The car looked great in the basement of the dealerships detail department and I was informed that the car had been gone over with LED lights to make sure there were no defects. I looked it over very carefully and asked if we could bring it outside in the direct sunlight to do a final paint inspection before the PPF was installed on the front end. Luckily we brought it outside because sure enough there were some very fine imperfections on the hood that required some quick polishing to remove. 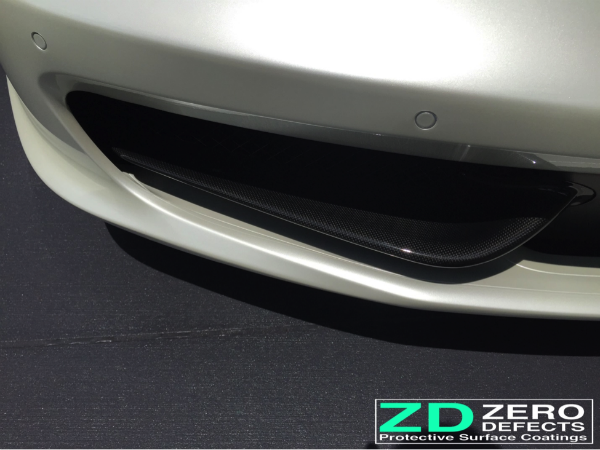 After that the car received a full front end PPF install and the proud customer took delivery of his pride and joy. The car needed a few days for the film to finish drying and we planned a full coating for the entire vehicle the following weekend. 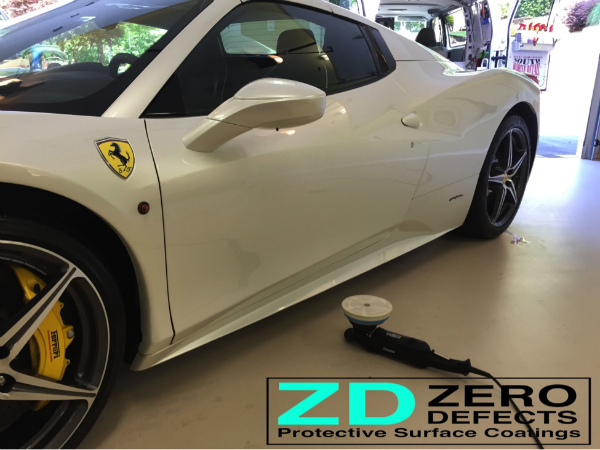 The plan was to install 4 coats of Ceramic Pro 9h Nano ceramic coating to the paint that was not protected with the PPF to give it a super hard thick layer of coating to protect the paint from any possible damage. 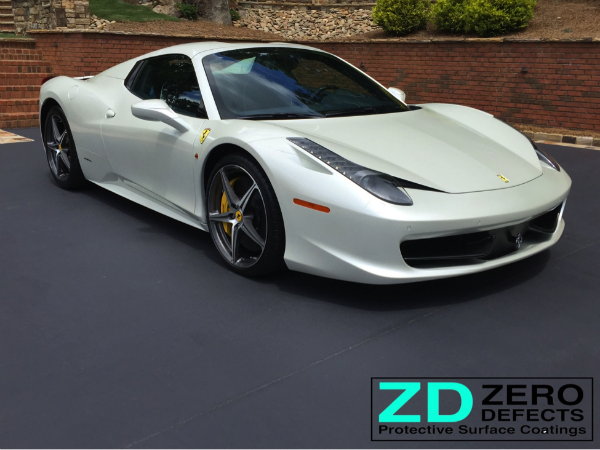 Then 2 coats of a second coating called Ceramic Pro Light to add incredible gloss and hydrophobicity to the entire car to provide a self-cleaning effect. Also the windows were coated with a special coating to protect from hard water spot etching and also to provide safer driving in the rain. And last but not least the wheels & calipers were coated as well to make cleaning a breeze. Here it is at the dealership when I did the Pre delivery inspection detail. The owner took it out 1 time for a drive before I got my hands on it. He said this car attracts just as many bugs as it does attention from nearby drivers. The rest of the car that did not receive the PPF was then polished with a super fine polish just to further refine the paint to bring out every bit of gloss possible. This paint was in very good condition so a very light amount of polishing was needed. So on the coating process I went. 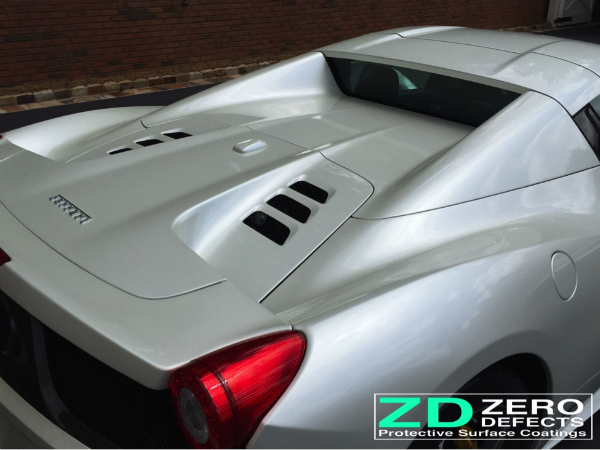 Ceramic pro 9H was used to provide a super hard layer on top of the paint to provide the ultimate layer of protection. 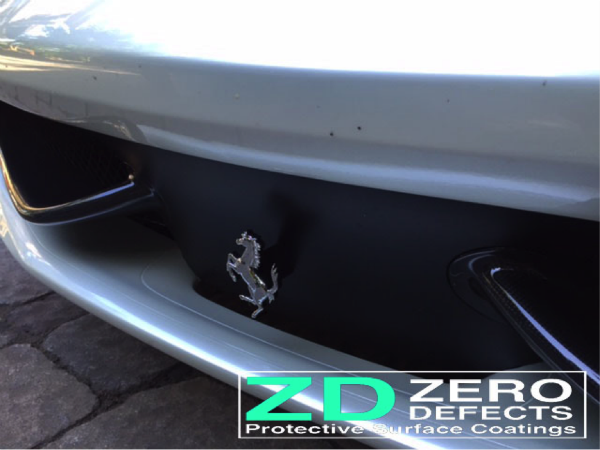 4 coats were used to stack the coating providing even more protection than other coatings can provide. Here you can see the shine starting to really show after the four layers were installed. 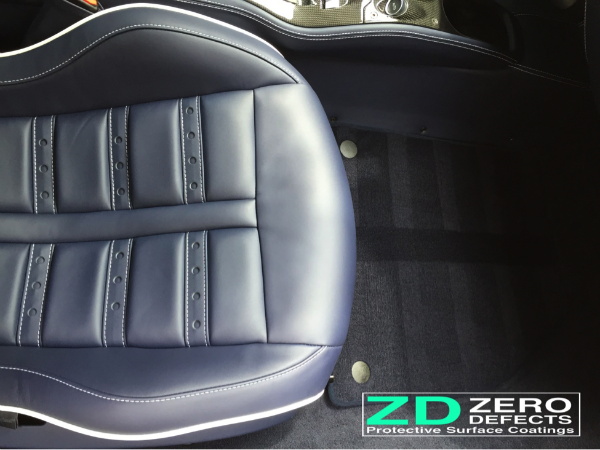 The interior was protected with a fabric coating on the carpets and a leather coating as well. 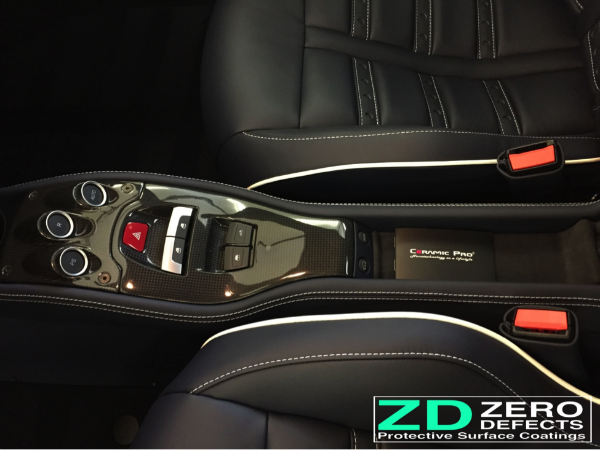 1 layer of 9H on the carbon trim work will stop any defects from happening while navigating the vehicle. 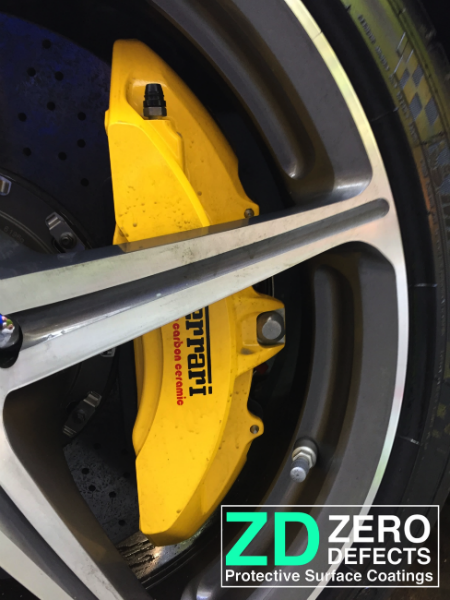 Wheels and calipers were coated as well to protect from road damage and to provide super easy cleaning. You can literally use a garden hose to spray off any brake dust. 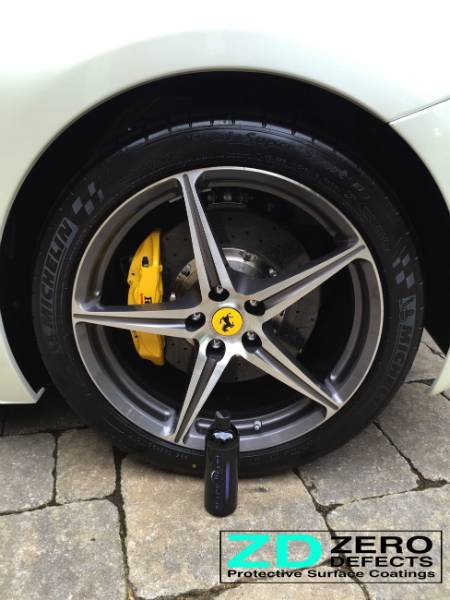 Ceramic Pro light provides such a slick surface that cleaning the vehicle becomes effortless. Black Pearl tire coating was added all the way around. This is the pinnacle of tire shine. It goes on with a paint roller and after 2 coats totally dries up leaving a super clean tire coating that lasts months not days. This stuff looks absolutely fantastic and doesn’t have any oily residue that slings when you drive. Here it is the evening of the first day of the install. The car was left overnight for the base coats to cure. I went back the next morning to install the last 2 coats of the light. The gloss that the light provided was incredible. It made the paint almost look fluid. I started calling the car flossy because there was so much gloss that the car’s paint looked fluid. So now there’s a new word to describe your car if you have the Ceramic Pro gold package on you car, Flossy!! Well here it is in all its glory. What an absolutely stunning vehicle. I thoroughly enjoyed working on this vehicle and am very pleased that I will get to maintain this car from here on out. 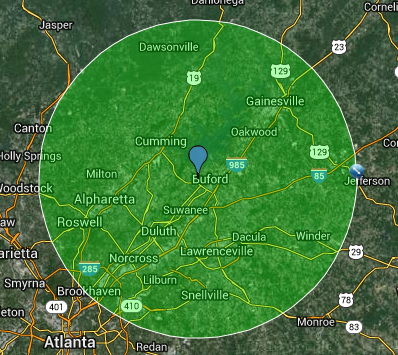 The coating will make my life easier and the owner can rest assured that this beauty is 100% protected.